Handbook of Death and Dying, Volume 1 as well as in both of Drew Gilpin Faust’s works regarding death during the Civil War explains that antebellum American culture was preoccupied with death – both in their own as well as with their family members. For Christian America, death was viewed as a temporary separation with the family. The family and dead would eventually all meet, if all were saved Christians, in heaven. In both Faust works about dying, she describes at length America’s practice of Ars Moriendi (the art of dying). In mid-nineteenth century American culture one either died a “good death” or a “bad death.” The “good death” was when a person died in their bed at home with family members gathered around to witness both the death itself, and, the nearly dead person’s last words of wisdom as well as his or her declaration of believing in Christ. A family member would record these events for the family records. If an adult died without someone witnessing the last words and the affirmation of being saved, the family would then not know if they would meet the dead person in heaven. The “bad death” was one of two types. A person died suddenly and no family members were with the deceased to witness the death event. This type of death would cause the family to doubt whether or not they would reunite with their loved one. The other example of a “bad death” was if the dead person had done something to shame the family, such as commit treason, desert the army, or die by means of execution. The family then considered that the deceased would not enter heaven. According to Mark S. Schantz, Awaiting the Heavenly Country: The Civil War and America’s Culture of Death, he tried to find differences in the way Northerners and Southerners practiced death customs as described by Faust, but, his “reading of the evidence sustains the old cliché’ that death is the great equalizer among human beings. 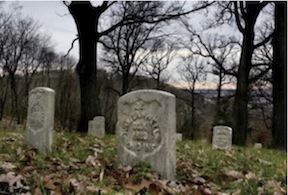 There is considerable irony in the observation that a shared body of cultural assumption and attitudes about death helped to sustain a war that fractured a nation.” In Faust’s Republic of Suffering, she expanded on Shantz’s observation and stated that on both sides of the Civil War, the solders had to be both ready and willing to die, and had to understand their duty of sacrifice. Both authors discuss that during the Civil War, that dying was preeminent to killing in the mind of the soldiers. Faust further states the soldiers were better prepared to die than to kill, because they lived in a culture that provided lessons on how to die. Clinton and Silber, Divided Houses: Gender and the Civil War, further explained that especially in the Confederacy that mourning became a significant social, cultural, and spiritual duty. Mourning not only took on the dimensions of heavenly reunion for the family, but it took the dimension of public grief, a communal gain, and the concept of Christian sacrifice that contributed to the ultimate Confederate victory and nationalist effort. In our next article, you will see how these first three articles fit into the role that women Civil War nurses played. Clifton D. Bryant, Handbook of Death and Dying, vol. 1, (Thousand Oaks, CA: Sage Publications, 2003), 569. Catherine Clinton and Nina Silber, Divided Houses: Gender and the Civil War, (New York: Oxford University Press, 1992), 184. Drew Gilpin Faust, “The Civil War Soldier and the Art of Dying,” in The Civil War Soldier: Historical Reader, eds., Michael Barton and Larry M. Logue, (New York: New York University Press, 2002), 486. ______, This Republic of Suffering: Death and the American Civil War, (New York: Vintage Books, 2008), 6, 27. Mark S. Schantz, Awaiting the Heavenly Country: The Civil War and America’s Culture of Death, (Ithaca: Cornell University Press, 2008), 4. This entry was posted in Civilian, Common Soldier, Medical, Ties to the War and tagged Civil War Women Nurses, death and dying, nursing, nursing-series. Bookmark the permalink.